Glulam is manufactured using Pinus Elliotti (slash pine) from sustainable sources. Lumberworx Glulam GL17c is strong enough to replace flitch beams or steel in most circumstances. Builders are able to cut these using standard tools eliminating the need for the amendments you would require with steel products. Glulam is treated to H1.2 meeting the strict New Zealand building codes. Glue laminated beams (Glulam) are solid wood members manufactured by bonding multiple pieces with proven adhesives to form a larger structural member. Glulam is more uniform and offers improved structural performance over sawn timber. Lumberworx distributes GL17c manufactured by Warrnambool Timber Industries. This product is manufactured from slash pine (pinus elliotti) with high stiffness and with the standard radius camber (see camber details below). Warrnambool Timber Industries (WTI) was established in 1988 and with a forward vision and modern facilities has built a solid reputation for quality and professionalism that sees their products distributed throughout Australia and exported to international markets. The renowned natural strength of timber is enhanced by the glue laminating process, ensuring GL17c is comparatively lightweight and ideal for long span / high load applications. GL17c is ideal for lintels over large window and door openings, garage openings or roof beams where spans over large spaces are required. Other lengths are available upon request. An out of increment charge will be applied. Pinus Elliotti (slash pine) from a sustainable source in a structural finish. Glulam 17c is H1.2 treated in accordance with NZS 3604 (A5). This product is not suited to exterior unprotected situations where exposed to weather but may be used in any protected situation suited to H1.2 Boron treated sawn Radiata or Douglas Fir under NZS3602. A taper cut of chamfer must not exceed 0.15 of the beam span without nail plate reinforcement. The minimum depth remaining for the Glulam at the support must not be less than half the original depth of the beam. Exposure of Glulam to the weather for the period of construction is acceptable and will not result in structural damage. Exposure for longer periods may result in swelling and discolouration. Timber glue-laminated (glulam) beams with a “C” suffix designates a vertical camber radius of 600m. An “S” suffix designates a straight beam profile. Alignment tolerance of both straight and cambered beams shall be no more than 1mm per metre of beam length. Cambered beams are generally supplied with a marking stamped on the top edge of the beam. Unless specifically requested (such as for large cantilevers), cambered beams should not be installed with the camber arch facing downwards. Lumberworx has a no returns policy due to the special handling and storage requirements of Glulam, and because of the Building Act implied warranty that all materials supplied must be "new". The LIB88s is available through your local merchant or truss and from plant. Give the Lumberworx team a call, they are happy to point you in the right direction. 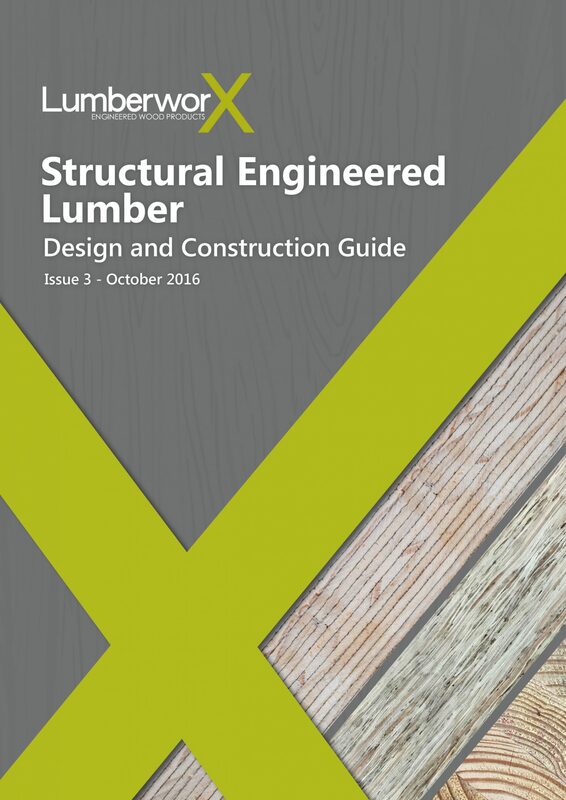 The Lumberworx Design and Construction Guide contains all the information needed to install and specify the structural engineered lumber range. A product technical statement (PTS) summarises the key details about your building product or system to make it easier for everyone in the building process. The substitutions bulletin includes information on substitutions of the Lumberworx products and the verification of this. If you have any questions or would like to order a hard copy of one of our guides, please leave us a message.